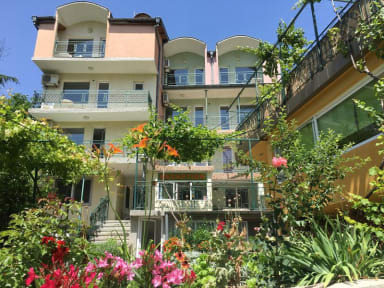 Royal Hostel is situated in a calm and quiet location, 150 m away from the beach, 1 km away from the Golden Sands center, where guests can find multiple night clubs, restaurants and casinos, and 12 km away from Varna City. The hostel offers its guests a classic continental breakfast, free Wi-Fi and free parking. The majority of the rooms have large balconies with beautiful sea views, and all rooms are equipped with TVs, refrigerators and air conditioners. 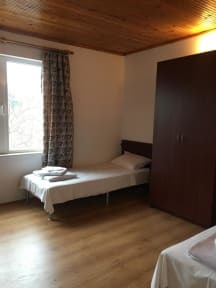 The more spacious rooms in the hostel can accommodate big groups of friends, families with children or self-traveling tourists looking for new emotions and adventures. Royal Hostel offers shuttle services upon request and at a surcharge to and from the airport, train station and bus station. Payment upon arrival by cash or credit card (Visa, Euro/Mastercard, JCB, Maestro, UnionPay credit card).